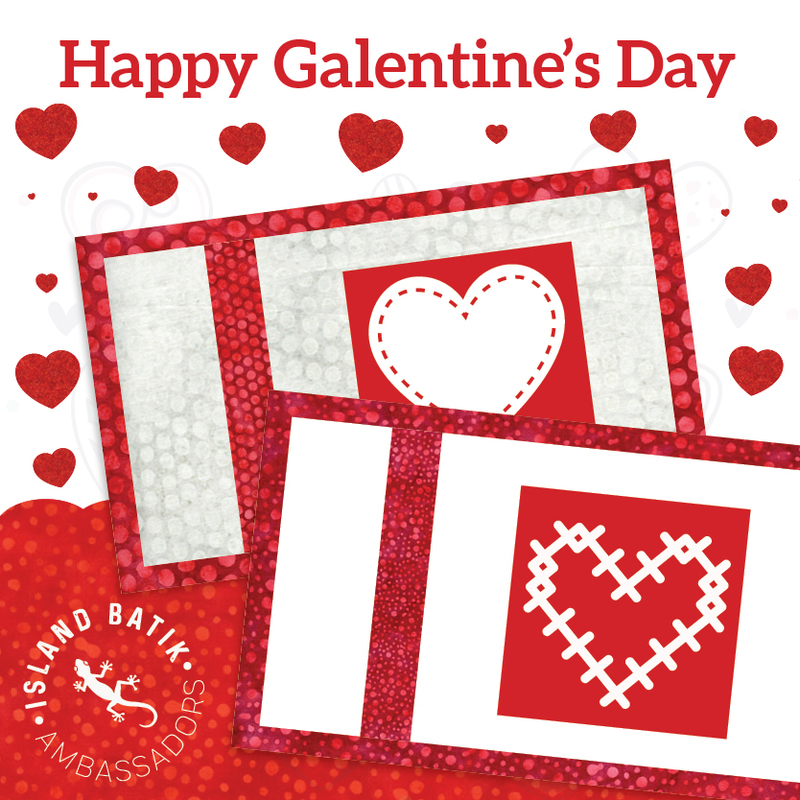 Happy Galentine's Day! 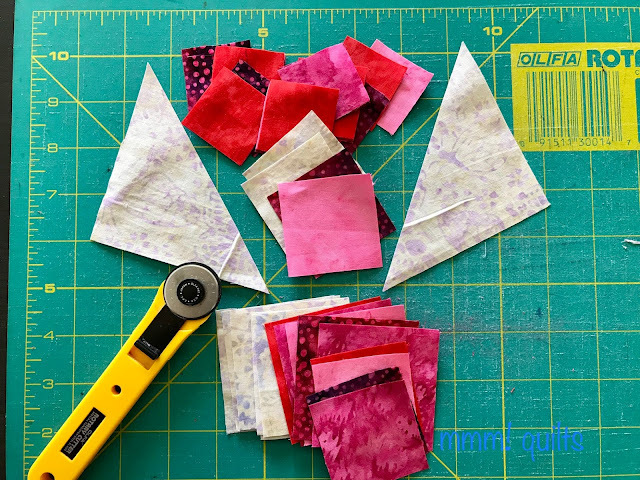 This is my first challenge, and project post as a new ambassador this year for Island Batik, and I am very excited to show you what I did with supplies they, along with Aurifil and Hobbs Batting provided. 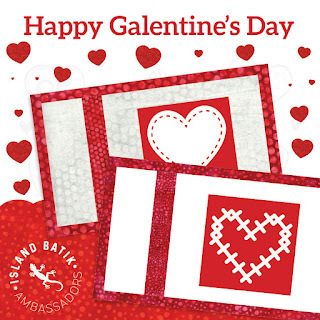 Galentine's Day, for those of you who may be unfamiliar with this newer day of celebration is when we celebrate our girlfriends, aka gal pals. I am blessed with many good women friends, IRL, in QBL and in crossover land between those two! 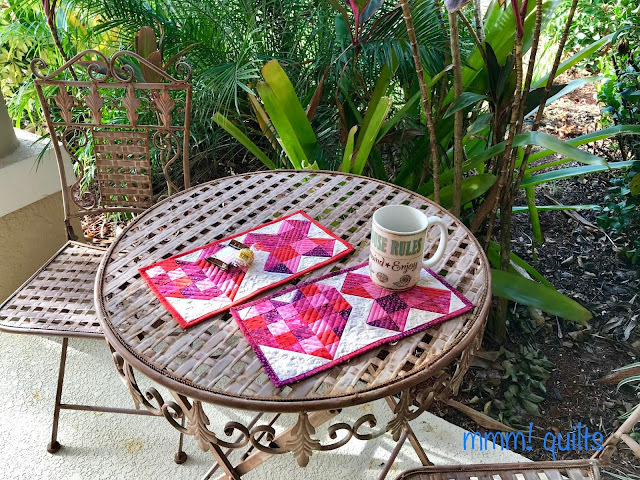 I made two mug rugs because it doesn't take much more time to make two as to make one, and I am giving these to two very deserving amazing women. 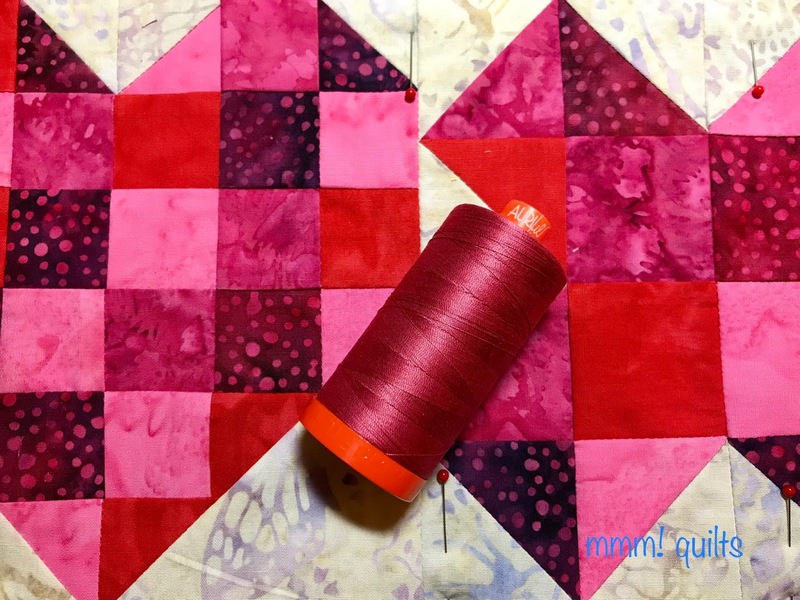 Here is what I started with, a fat quarter bundle of 5 red, pink and off-white fabrics from Island Batik. This is what I made, which I'm calling 'Hugs and Kisses'! I designed this last year as a gift for another good friend, Jasmine, which you can read about here, calling it Quilt Kisses, which is à propos for the mug rug, but also because that's the name of her blog. I thought it would be great to make again for the challenge. It measures 6.5X12.5" and would make a great mug rug, a mini for your mini wall, or a candle mat. 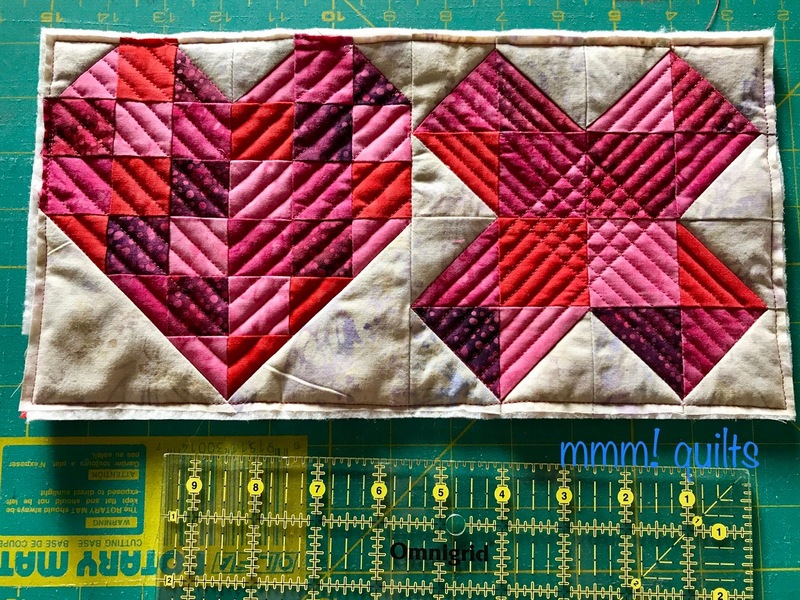 It's great for practising some FMQ too, since the piece is very maneuverable. The backs. 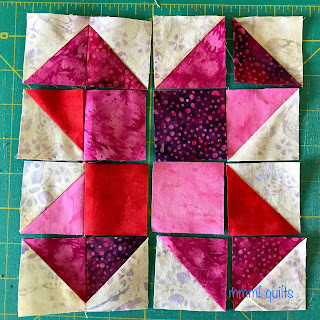 My favourite in the FQ pack is that top pink, berry, purple and magenta batik. In the bobbin I used a red Isacord polyester which worked beautifully with the Aurifil magenta on top, and an Aurifil pale yellow, 2123, which I already had, to go with the Sulky Blendables. I had the perfect spool of Aurifil thread in my Island Batik package. I used it to walking foot quilt the heart and the X.
I did straight-line walking foot quilting in the red/pink areas and a tiny flower or perhaps butterfly 😉meander in the background. How I love this background fabric! Want to make one? They're pretty quick, with a slick method I thought of myself (ha!) 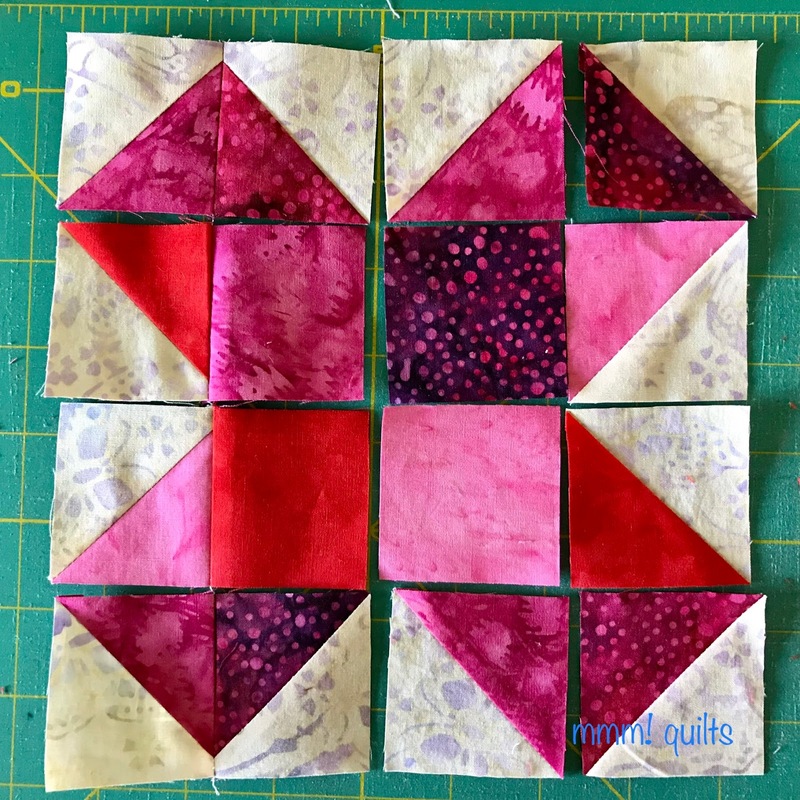 to avoid 6 small HSTs. If you'd like a free PDF of these instructions, click here. (affiliate link). 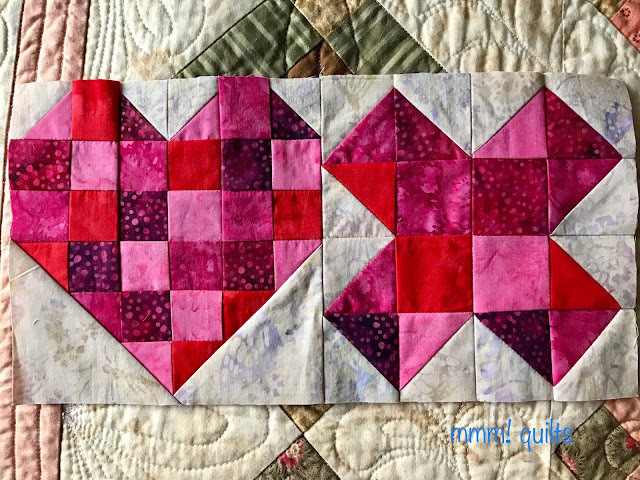 scraps or fat quarters of pinks and reds and a light for the background; batting scrap approximately 8X14"
single-fold binding strip 1.25"X 45"
Place your 26 squares on your design wall in a pleasing pattern. I actually did not overthink this at all; just wanted a random placement. 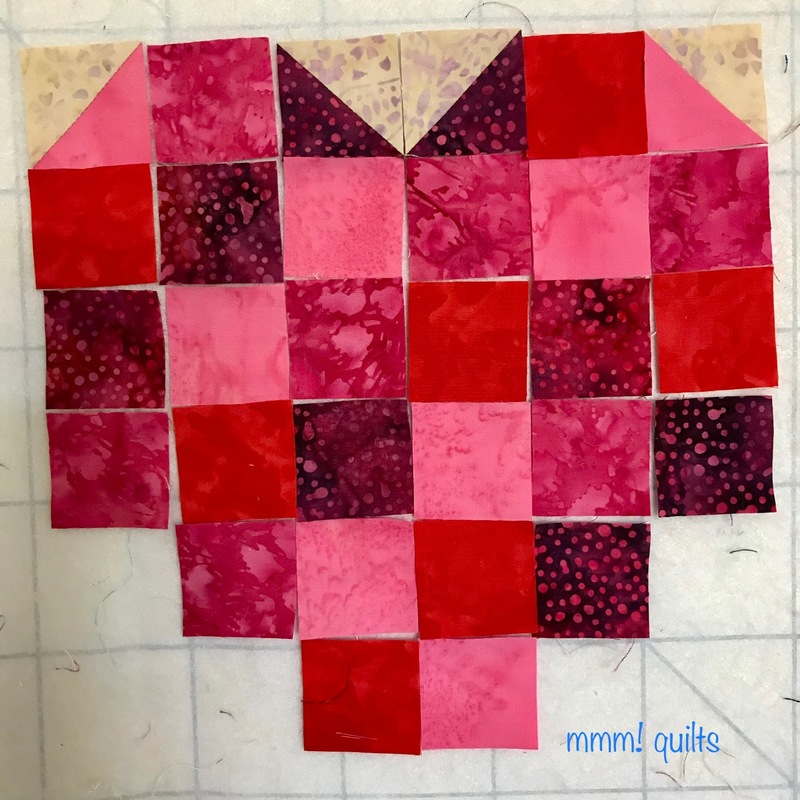 To make the 2" HSTs, layer a 2.5" background square with a 2.5" red square, marking a diagonal line on the wrong side of one of the squares. Sew 1/4" either side of the line. 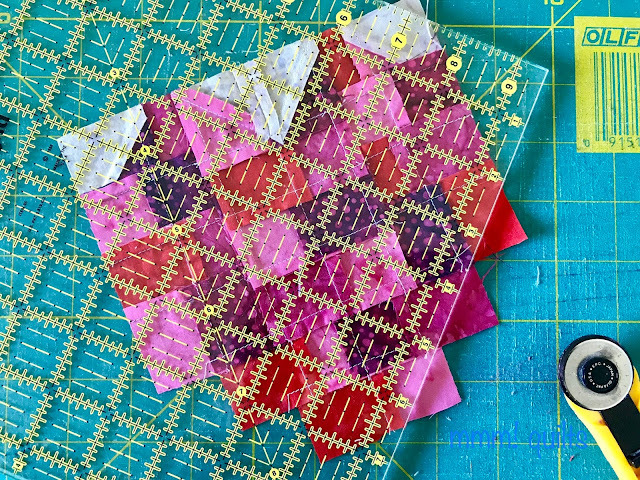 Cut on the drawn line, press open and square to 2". Make 4. Place them on the design wall in the top row as shown below. Piece the heart, either in rows or in columns, which I prefer as it keeps everything chained together in order. For more on that method, called Book It! go here. 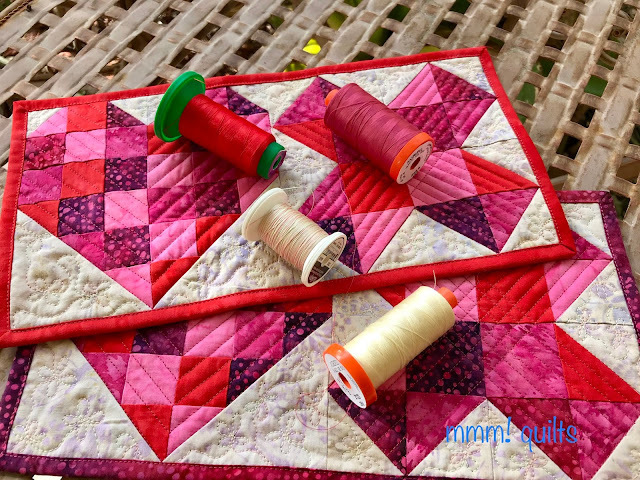 I use it all the time, large quilts and small, have showed many others the method too, and are they impressed. I learned it years ago in a colourwash class. The 45° line is along either a seam line or a stitching line, and the 1/4" line at your cutting edge is on the seam line. The ensures the cutting edge is 1/4" to the right of that stitching line so you will have your seam allowance. Cut. Repeat on the other side. You will have a heart that looks like the one on the left. Now place a 4" HST you cut out right sides together, on one side of the heart. I like to fold the HST in half to find the mid point, and do the same with the heart cut edge to line things up perfectly. Then I like to sew with the heart facing up so that I can sew right through the seam intersections. Sew both sides. You will then have the block on the right. Trim to 6.5". 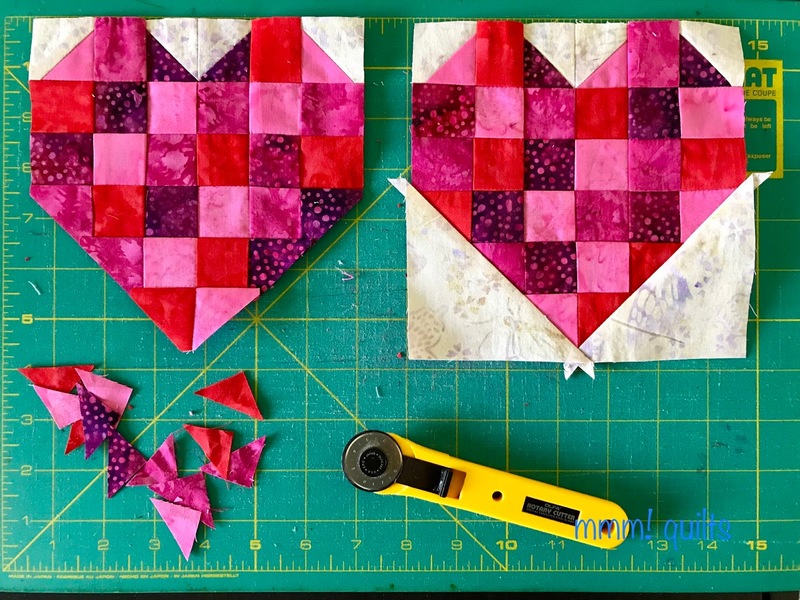 Note that the 4" squares you cut are a bit oversize so you can trim to a perfect 6.5" size. Piece the 6 HSTs, layering a red/pink/magenta square atop a background square, as you did for the heart small HSTs. Tip: I pressed half of the seams to the background and the other half to the colour so that they will nest nicely when within the block. Lay out the block on your design wall. Here you can see I've already chain-pieced the left column as per the Book It! method. Press. 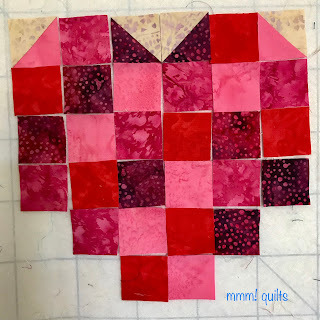 Now sew the X block to the heart block. This is the one with the cotton batting, slightly more poofy than the Thermore. I debated for a while on what to do in the background, more lines or a flowing design for contrast. 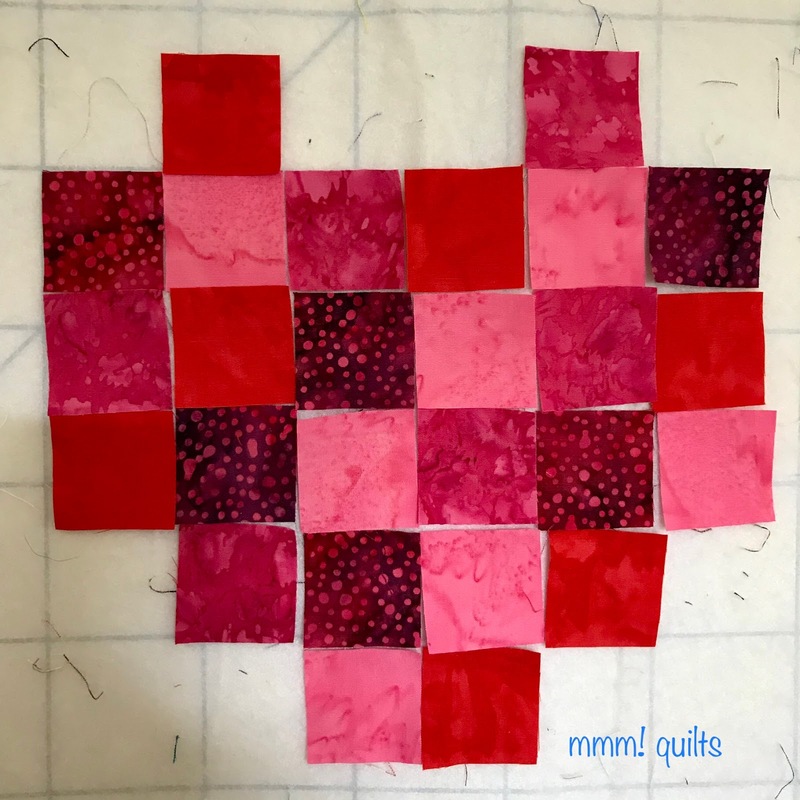 I hit upon the little flower meander because it can be quilted small, it's sweet, and it echoes the butterflies in this lovely fabric. The Sulky Blendables 30 weight was just perfect to use, soft yellow, cream, peach, pink and pale green! 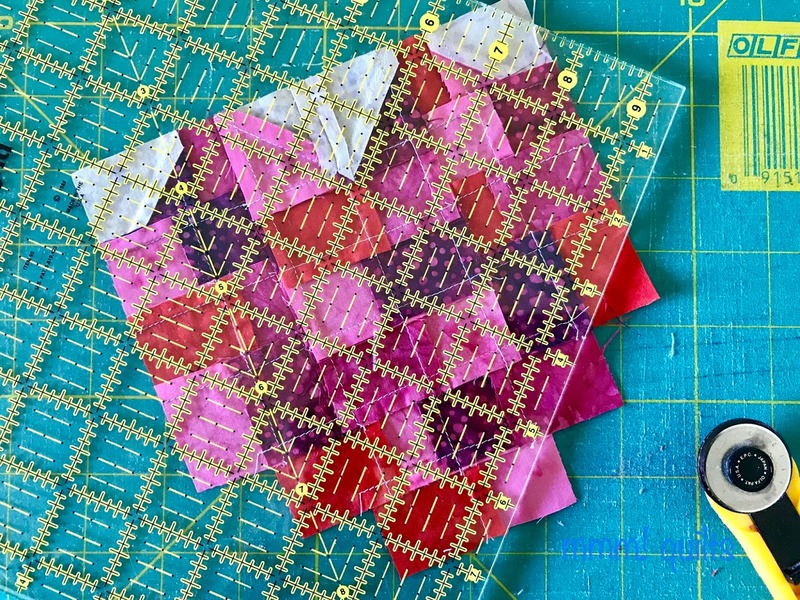 The four threads I used for quilting and top-stitching the binding down. As I said, I switched from the red Isacord to the pale yellow Aurifil in the bobbin. I tried, but even with tension adjustments, I still got some 'pokies' on the back, or sometimes on the front, and we can't have that! I used a Topstitch 90/14 Schmetz needle and backed the tension off quite low, and then FMQ-ed away. These two threads played very well together, and the pale yellow on the red or magenta backs is not bothersome IMHO. Bind with a 1.25" wide single-fold binding. I like to do that because it's finer on a mini, but with limited amounts of fabric, it also means half as much is needed. I stitched it to the back and top-stitched it down on the front with the magenta. It sure blends lovely with all the shades of red doesn't it? Let me know if you decide to make one, as I'd love to see it! If you'd like a free download of these instructions in PDF form go to my Crafsty store (affiliate link). Those are super cute! Great tutorial, too! Love your mug rugs...and we will be seeing a lot of each other this way. Happy Galentines Day! 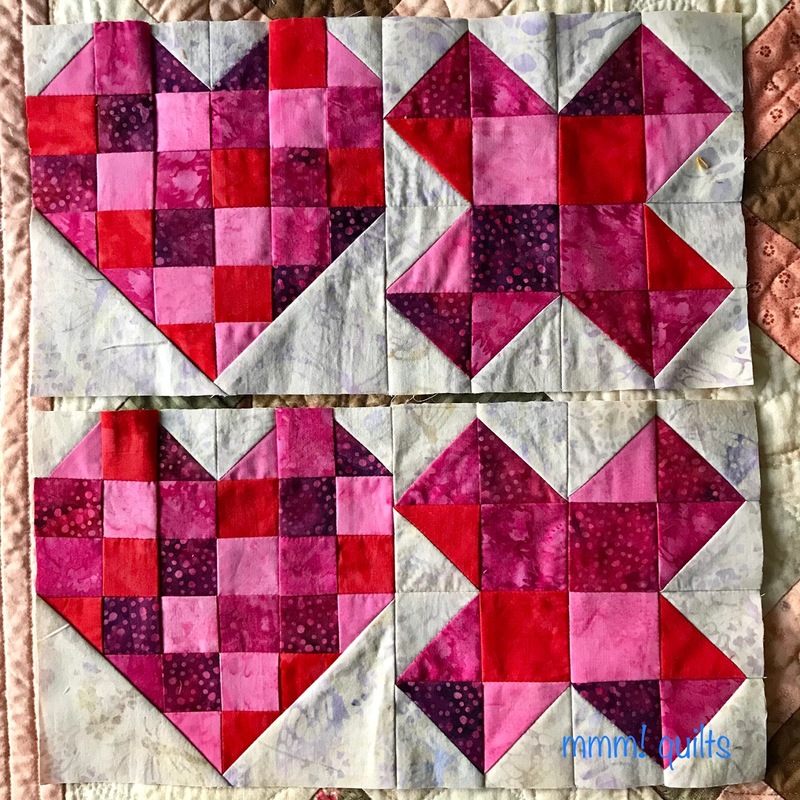 You made perfect use of those rich reds and hot pinks, Sandra! What a sweet way to celebrate the holiday! Great project. Wonderful fabrics you used. Congrats again on being an Ambassador. They choose well. Thank you for explaining Galentines Day. I need to mark that on my calendar for next year. The mug rugs turned out beautifully! Thank you for sharing the tutorial. Beautiful work! Happy you gave us a tutorial to go along with your design. Hugs'n'Kisses perfect for Galentines day. Great tutorial! Perfect fabric for these mug rugs! Bright and bold! Thanks for sharing your wonderful tutorial too! Hugs and kisses, so descriptive. 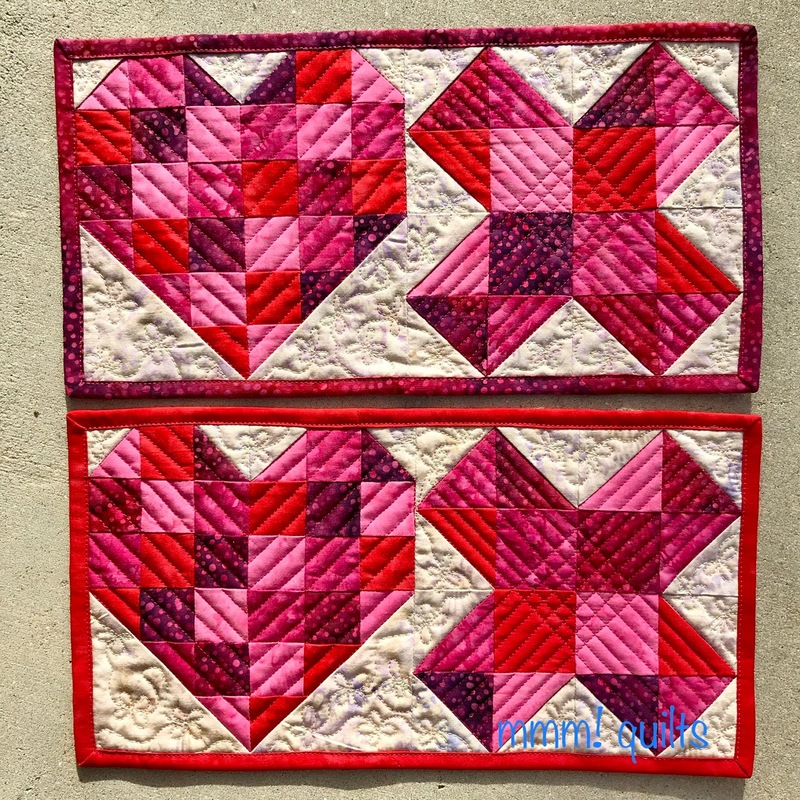 They are gorgeous, and I love how you quilted them too. Now I'm off to get my download! I absolutely love mine and I’m sure these will be appreciated too. I keep mine on the shelf right by my sewing cabinet and look a it often. 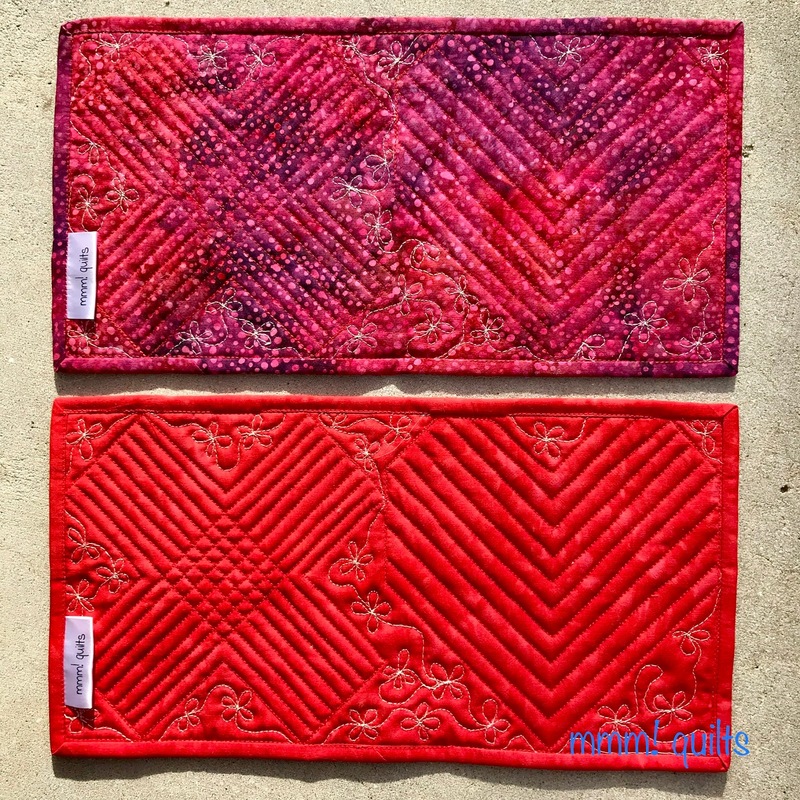 Very fun mug rugs - thanks for the tutorial!